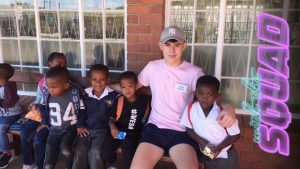 Missionvale Reflection 2019 – James Power. My experience of Missionvale was just unbelievable. From the 15th of February to the 26th of February 2019 were the most enjoyable life changing moments of my life and will always stay with me. It has been one of the best weeks of my life so far. It all started off in Shannon on the 15th and that’s when our journey to Missionvale began. When we arrived in Port Elizabeth and got settled in and seeing the wealth of the city and knowing we were so close to the Township I was rather confused at how it could change from wealth to severe poverty in such a short distance. I was really looking forward to Monday to just see the Township and get there so I could get my head around the difference. Driving in that Monday was scary seeing poverty everywhere and kids everywhere going to school squashing into mini-busses first thing in the mornings. What came to my mind was how we could find a way to sort this out for them. For example, getting the rubbish up, getting dogs, cattle, sheep and pigs out of the Township and to house them in a home for themselves? 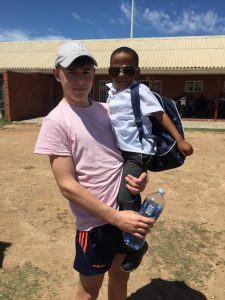 I wondered how, throughout the week, we would get to know the people there and experience the Township more. By the end of the week I just didn’t want to go home. I week was too short helping the people who care so much for everything you do. I continuously said throughout the week that I didn’t want to go home to my teacher but I wasn’t messing. I wanted to stay and help and give more of my time to the people of Missionvale. It’s such a life-changing experience and I would encourage people who are thinking of going to go. They won’t regret one bit of it and hopefully soon enough I’ll be able go back myself. By killaloeteacher in Other on March 25, 2019 .